Photograph collection of webmaster Oxford shed on a gloomy November 12th 1965, 4MT 2-6-2T No.6106 keeps company with recently outshopped Class 24 No.5011. The sixteen year three month career of D5011/24011 saw allocation to London Midland, Southern & Scottish depots. Delivered with Athermos axleboxes (D5010 - D5019). Full size fuel & water tanks (shortened water tank added later). Four upper and four lower air filters on non-BIS side, three upper and four lower on BIS side (standard arrangement). Additional headcode disc brackets fitted (for use with SR six disc headcodes). Time between withdrawal & scrapping: 18 months. March 1959 to Derby (17A) on loan. April 1959 to Hither Green (73C) on loan. May 1962 to Crewe South (5B). May 1962 to Willesden (1A). June 1962 to Crewe South (5B). June 1962 to Rugby (2A). September 1963 to Rugby (1F). June 1965 to Bletchley (1E). April 1966 to London Division (D01). July 1966 to Birmingham Division (D02). May 1967 to Stoke Division (D05). 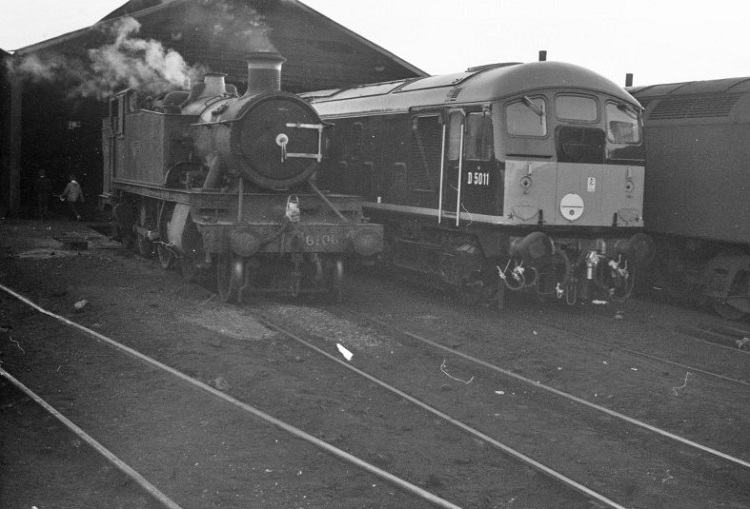 January 1969, stored (at Chester). June 1969, reinstated to Stoke Division (D05). October 1971 to Polmadie (66A). July 7th 1975, stored unserviceable. October 5th 1975 - withdrawn. 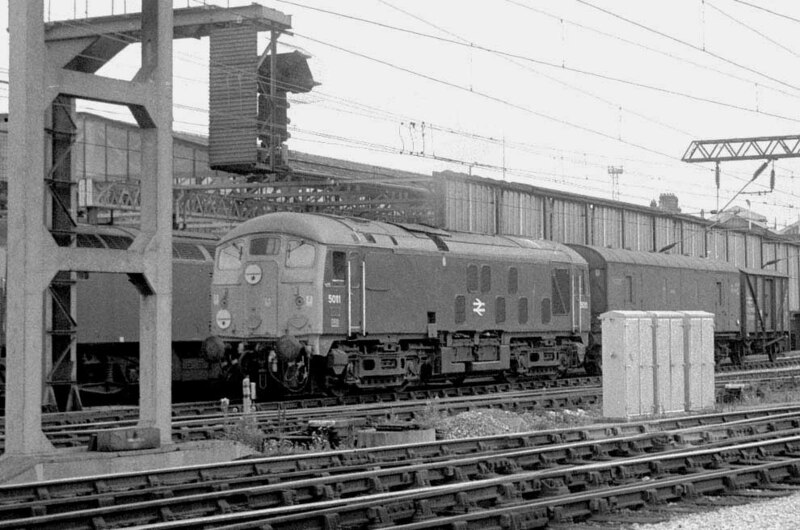 24011 was stored at Carlisle from July 1975 to March 1976. It was moved to Glasgow Works on March 15th 1976 with 24002/04/10 and scrapped there by April 1977. Noted Eastleigh Works December 1961. Noted Derby Works September 1962. Noted Derby Works January 1965. Noted Glasgow Works April 1965. Noted Derby Works October/November 1965 (repainted). Noted Glasgow Works August - October 1973. The working history of D5011/24011 belongs to a small sub-group of the class, particularly its three years of service on the Southern Region, a period of store during 1969 and its closing years spent in service on the Scottish Region. Prior to its return from the Southern Region, D5011 visited Eastleigh Works for overhaul prior to heading north. On January 25th ex-works D5011 was tested on the 11pm freight to Nine Elms prior to its release from Eastleigh Works. 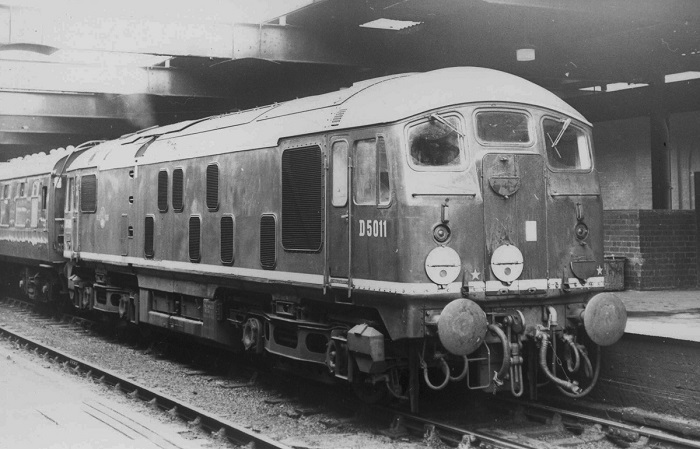 Photographer unknown A fine portrait of D5011 at Birmingham New Street on July 30th 1962. The locomotive has recently returned from the Southern Region and is now allocated to Rugby depot. Both bogies carry axles with Athermos axle boxes and the two-rung bogie mounted steps. The cab front carries the headcode disc brackets fitted for use with SR six disc headcodes, whilst one of the blue star coupling symbols is in an unusual place. The locomotive still sports the original sized fuel/water tanks. During August 5011 was noted at Llanuwchllyn being used on the demolition train of the closed line between Dolgellau & west of Bala Lake. Photograph courtesy Tony Sayer A very short parcels working runs through Crewe behind 5011 on August 9th 1971. Between April 1967 and November 1968 5000 - 5066 were transferred to the Stoke Division (D05). 5011 has acquired a smaller water tank. Upon arrival at Glasgow Works for scrapping the locomotive carried bogies fitted with SKF axleboxes and three-rung footsteps. Headcode disc brackets fitted (for use with SR six disc headcodes), whilst the builders plates were present on the cabsides. Prior to its storage at Carlisle the engine exhaust and boiler exhaust vents had been capped. Externally the locomotive was in a very presentable condition, having completed an overhaul at Glasgow Works less than two years previously. Page added January 6th 2016. Last updated October 19th 2017.